The sun persists in rising. So I make myself stand. Excellent. Love this poster already. One quick glance and it has an epic, bold feel to it. I love the marketing for this series and it's getting better as they continue on and get more comfortable with the massive fanbase they're building. Lionsgate has debuted a gorgeous new poster for The Hunger Games: Catching Fire, once again starring Oscar winner Jennifer Lawrence as Katniss Everdeen. 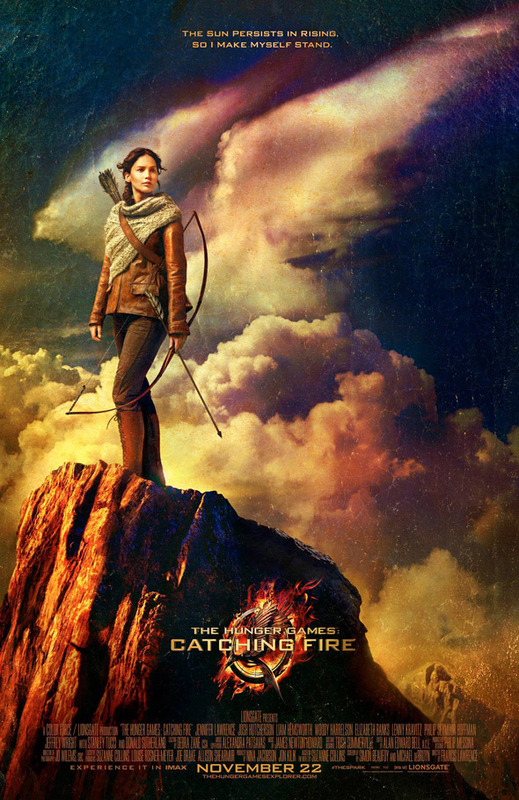 This was designed by Lionsgate's Chief Marketing Officer Tim Palen, whom I assume took this photo used on the poster. I love the colors as it makes it a bit more exciting, but not overly glossy. The Hunger Games: Catching Fire begins as Katniss Everdeen (Jennifer Lawrence) has returned home safe after winning the 74th Annual Hunger Games along with fellow tribute Peeta Mellark (Josh Hutcherson). Winning means that they must turn around and leave their family and close friends, embarking on a "Victor's Tour" of the districts. Along the way Katniss senses that a rebellion is simmering, but the Capitol is still very much in control as President Snow (Donald Sutherland) prepares the 75th Annual Hunger Games, a competition that could change Panem forever. Francis Lawrence directs the film written by Simon Beaufoy (Slumdog Millionaire) and Michael Arndt (Toy Story 3) and it arrives November 22nd, 2013. Excited? Interesting poster, even though I don't care about this series, I like it when the marketing guys try something a little bit different. That horrible "logo" though spoils it a bit (completely different style). You should give it a shot. It's not a stupid "teen fiction" thing like Twilight. It's ripe with social and political commentary, it's clever, and it has a great cast. I agree. It has that "teen fiction" stigma, but it's anything but that. I actually love it. Bravo. The clouds shaped like wings is a nice touch. Didn't notice it at first. The way they are marketing CATCHING FIRE, they are not even showing the games or anything. So far it has just been a lot of the aftermath of Katniss win. It should be very interesting how they incorporate that part of the story. Yeah, sure, I get that. I actually like the fact that the games haven't been featured in the promo for either one of them but I don't get this old vibe from the posters.